Cupcakes are just plain fun. They’re delicious and so cute. 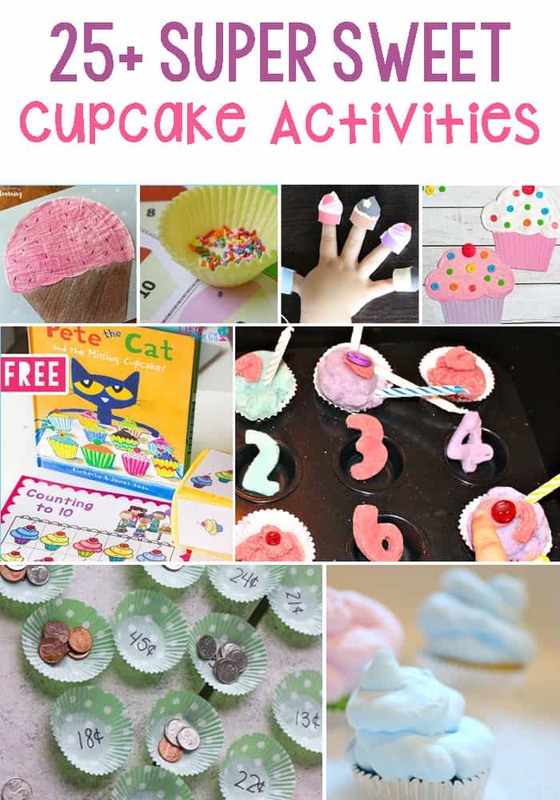 Whether you are a cupcake lover like me or looking for learning activities for a birthday week, these cupcake themed activities are perfect. I have found my favorite cupcake themed activities including math, literacy, art & crafts, sensory, and science. These sweet activities will have your kids craving more! Play dough can be a fabulous tool for encouraging children to practice a skill like counting. These adorable play dough cupcakes are perfect for ‘decorating’ while counting! If You Give A Moose A Muffin is a classic children’s book and the inspiration for this fun, printable math activity for kids. The best part is it can be customized to what your child is learning whether it is counting, addition or something different. I spy is a classic children’s game that encourages counting in a super fun way. It is also a game that is easily transferred between different themes, including cupcakes like this Cupcakes I Spy Printable. Counting has never been so exciting as when you’re using real sprinkles. These printables are the base for the counting activity while sprinkles are the star. These printable cupcake puzzles will help children with number recognition and counting. They are fabulous for Valentine’s day or for any cupcake theme activity! For kids who are working on letter recognition or learning the difference between upper and lowercase letters, this super sweet Cupcake Letter Match is perfect! Cupcake liners make fabulous covers for an ABC matching game. This cupcake liner matching game activity is perfect for children who are learning letter recognition or even beginning sounds. A fun spin on a classic rhyming song is Five Little Cupcakes. How perfect for exploring rhymes, literacy and of course cupcakes! Muffin tins are perfect for kids games. These literacy games all involve using muffin tins. This is fun, organized and can be done on the go! Coffee filters are the star of this adorable cupcake craft. Kids can create their own cupcake frosting on a coffee filter. This would make a fantastic card from a child as well! Puffy paint is such a fun art activity that is also full of sensory elements. The puffy paint also makes for excellent frosting like part of this cupcake craft. So much fun! 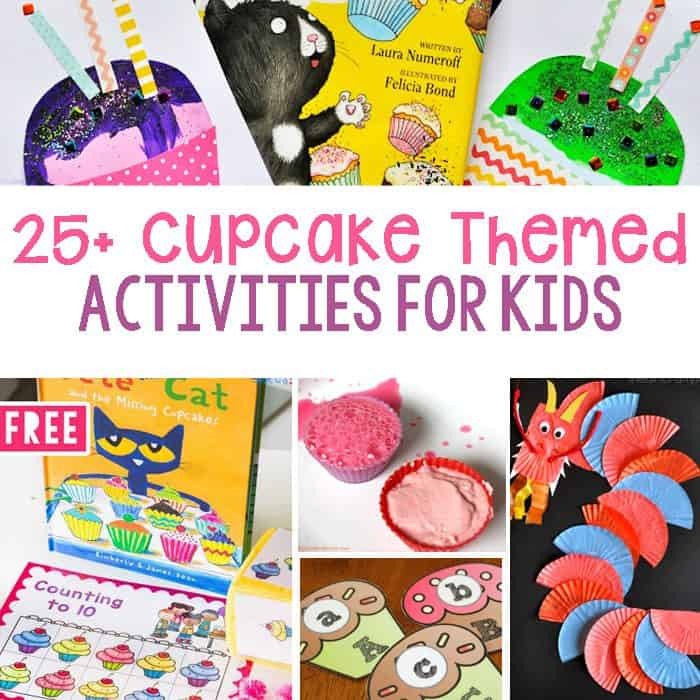 This cupcake craft uses so many different crafty elements that it is so perfect for creative kids! Each cupcake will be different, just like children are! Another simple cupcake craft is inspired by the fun children’s book If You Give A Cat A Cupcake. This match up is perfect for a cupcake theme! Cupcake liners make this dragon craft so creative. The dragon’s body is made from cupcake liners, which is also great for exploring patterns! Play dough is a fantastic sensory tool for kids and play dough mats can help increase creativity and imagination in sensory play. These cupcake play dough mats would be perfect for a birthday party..or just because! Learning colors is important and can be done so easily and in a fun way with this cupcake tin matching game. This is a great way to take learning on the go as well! Cupcake goo is a fun sensory experience and can easily be done with cupcake liners or silicone cupcake tins. If your kids are interested in gooey sensory experiences, this is perfect for them! This activity screams birthday party. If you’re hosting a backyard birthday party this invitation to create cupcakes is the perfect activity! Most kids love sensory bins and this baking inspired bin will be no different. It includes all different baking elements including sprinkles and muffin tins! This experiment is so cute and is inspired by the fun children’s book Pinkalicious. Kids will enjoy watching these colorful cupcakes make a fun fizzy reaction! How cute is this? This floating cupcake activity is excellent inside, outside, bath time or play time. Kids will explore floating while having fun! Plus, the shaving cream frosting is amazing! Science activities often have other elements included and these crayon resist ladybugs are an artistic science experiment. Kids will see how cupcake liners, crayons and watercolors turn art into science!